Dr. Brookes approaches the prevention of fatal incidents in outdoor education and related fields through meticulous examination of the role of case-based knowledge in fatality prevention. Dr. Brookes’ research on fatal incidents has directly impacted the field of outdoor education and led to numerous invitations to prepare expert witness reports informing legal proceedings. His latest work compiles what is probably the most extensive case-based study of fatality prevention in the global outdoor education field. 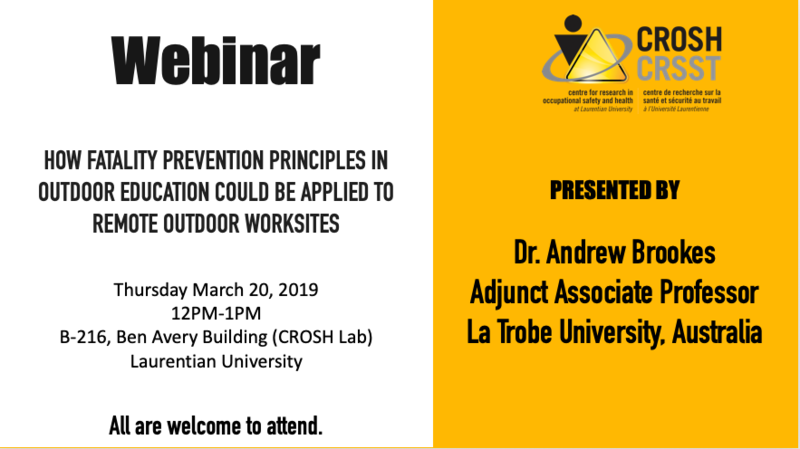 Webinar Description: Dr. Andrew Brookes will be at CROSH to deliver a webinar on how fatality prevention principles in outdoor education could be applied to remote outdoor worksites. His latest work compiles what is probably the most extensive case-based study of fatality prevention in the global outdoor education field. Join us to learn, and share dialogue on this compelling topic.